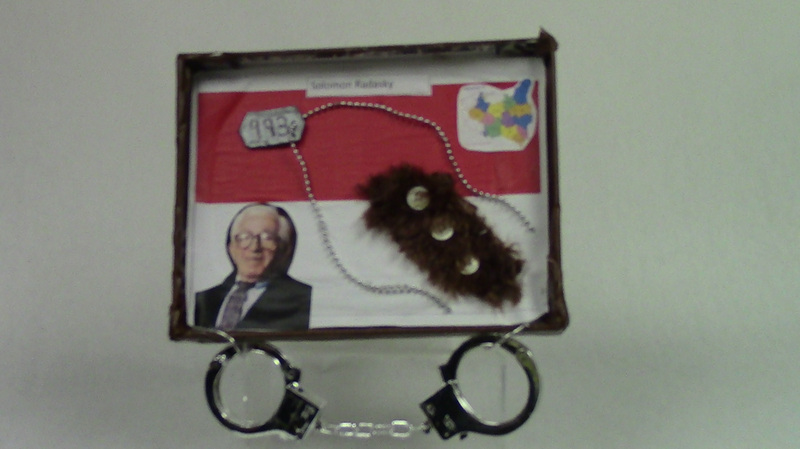 This shadow box, honoring Solomon Radasky, is wrapped in wood print paper to symbolize the objects that he used, and even slept on, in the concentration camps which were mostly made out of wood. In this shadow box there is a polish flag as the background and a picture of him on top of that (bottom left corner). This represents him being from Poland. The map in the top right hand corner of the box is a map of Poland because Solomon was born in Warsaw, Poland. Underneath the map, there is a piece of a fur coat because before being captured and taken to the concentration camps, Solomon owned a small shop where he made fur coats. In the first concentration camp that he was in he continued making fur coats, but this time for the German soldiers. The dog tag in the box is there because in the first concentration camp they took away his name and instead identified him by this dog tag with the number 993. Finally there are handcuffs hanging at the bottom of the box to symbolize being trapped by the Nazis and being contained in the ghettos that Solomon was trapped in. Solomon’s life-changing journey through the Holocaust began one morning in 1941. Solomon was 31 years old when the German police arrested him in the street. He was forced to work with a lot of other people in a ghetto clearing snow from the railroad tracks. His job was to keep the trains running. This hard labor was very different from his normal life and job of making fur coats, but Solomon was lucky to be doing labor instead of just being killed. While in the ghetto, Solomon made fur coats for the German soldiers. Solomon Radasky was born in Warsaw, Poland on May 17, 1910. He lived in Praga, which is the part of the city across the Vistula river. He was Jewish and lived with his mother, father, two brothers, Moishe and Baruch, and three sisters: Sarah, Rivka and Leah. The whole family was living a very happy life in Praga, where Solomon owned a small shop where he made fur coats. His mother and older sister were killed earlier in the year of 1941. His mother was killed because when she was asked for her fur and her jewelry she refused, so the German soldiers shot her and her daughter on the spot. His father was also killed in April 1942 because he was caught receiving food from smugglers at the gates of the ghetto. Solomon’s remaining two sisters and two brothers were taken to Treblinka, a Nazi death camp, on July 22, 1942, but he did not know this at the time. He never saw them again. One day, Solomon’s friend in the ghetto told him that he saw one of his sisters working at a different shop. Solomon, of course, wanted to see her, but he was three kilometers away and did not know how to get there. A Jewish policeman told Solomon that he could get a German soldier to go with him and bring him back to his shop. It would cost 500 zlotys, which was a lot of money, but he agreed. The soldier put him in handcuffs and walked behind him with a rifle. When he got to the shop, he could not find his sister anywhere. However, he did find out that he was stuck there because the ghetto had been surrounded by German soldiers. The next morning was April 19, 1943, which was the day the Warsaw Ghetto Uprising began. During the fighting, Solomon was shot in the ankle, but the bullet only went through the flesh and didn’t hit bone, so he was able to keep his leg. The ghetto soldiers couldn’t take him into the infirmary to be treated because there were too many people. They sent Solomon and many other prisoners to a death camp called Majdanek. At Majdanek they took Solomon’s clothes and gave him striped shirts, pants and wooden shoes. An older man at Majdanek told Solomon that he could help him because he had been a doctor. The man used a little pocket knife to operate on Solomon. There were no bandages, and Solomon would have to use some of his own urine to clean and help heal his cut. He had to walk three kilometers to work, but he didn’t limp because if he did he would have been hanged. When the man was caught smoking and Solomon was seconds away from being killed, a soldier from a different Ghetto ran in and interrupted because Solomon was being transferred to a different ghetto and could not be brought there dead. So, the rope that was around his neck was removed and he was taken away. Solomon was moved to several different camps but was able to survive. When the Allied soldiers got close to the camps, the Nazis put the prisoners on the trains to the mountains. At 4 a.m. on May 1, 1945, the prisoners heard heavy traffic outside the train. Everybody started hollering and crying. The American soldiers told them that they were free and arrested the German soldiers. Solomon had been liberated. After all of the long, hard years, surviving several concentration camps, Solomon was finally free. Before World War II, there were 750,000 Jews, about 30% of the total population of 1.3 million, living in Warsaw, the capital of Poland. During the war, the Warsaw ghetto had over 450,000 prisoners in it. More than 80,000 people were killed in this ghetto. At the end of the war there were only 174,000 people left in Warsaw, and only six percent of them were Jews. That means that there were approximately 11,500 Jews left in Warsaw after World War II, and Solomon Radasky was one of them. Out of the 78 people in his family, Solomon was the only one to survive. After the American soldiers rescued Solomon, he moved to New Orleans. He could barely speak English, but he got a job at a local fur shop working for fifty cents an hour. Solomon lived in New Orleans with his two children and his wife until August 4, 2002, when he died at age 92.